Thank you for accessing Bio-Tree. Bio-Tree is the inventor and implementer of the Vasculomics® Platform which, was designed to process 3D data sets produced by a variety of tomographic scanners to detect and very precisely reconstruct for geometric and morphologic analysis organ-specific 3D micro-vascular trees. 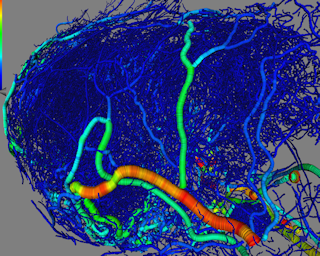 Furthermore, the analytical micro-vascular metrics already developed and utilized to analyze tumor angiogenesis in oncology are directly applicable to analyze 3D scans from any organs and capable of detecting organ specific diseases expressed in abnormal micro-vascular patterns. The Vasculomics® Platform belongs to the new field of Precision Medicine. We welcome your interest in Bio-Tree, including our application for the oncology drug discovery industry, Bio-Tree PreClin, that expands our Vasculomics® Platform to additional pre-clinical markets.